"Once upon a time, Dad received a similar recipe with a bundle of fresh green beans. He made the recipe once and then lost the card. After many attempts to recreate that flavor, he declares that this, his own recipe, is even better!" Place the green beans in a large saucepan or pot with one inch of water. You may place them in a steamer insert if you have one. Bring to a boil, cover and cook for 5 minutes, they should still be firm and bright green. In a small bowl, stir together the soy sauce, balsamic vinegar and sugar; set aside. Heat the sesame oil in a large skillet over medium heat. Add garlic and cook until starting to brown. Add the green beans and stir to coat with the oil. Stir in the soy sauce mixture and simmer for a couple of minutes uncovered to reduce the sauce. Transfer the beans to a serving dish and pour the sauce over them. as Rachel Ray would say: YUMMO! I didn't have sesame oil though so I used olive oil and added 2 tablespoons toasted sesame seeds and was happy they worked out. Great recipe! thanks! This was good but not our favorite. I find that adding the garlic at the middle of the cooking time helps the garlic maintain a better garlic taste. 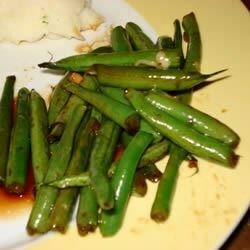 This is the perfect recipe for green beans! Don’t change a thing!